Peachy Airport Parking is the closest Atlanta ATL off-Airport parking located at 3100 Sylvan Road! Exit 75 off of Interstate 85 and make a right at the end of the exit ramp. We offer outdoor parking facility with extra-wide spaces and a friendly staff to assist you. We have brand new shuttle vehicles with dual air-conditioning and upgraded interiors. We offer the security and peace of mind you deserve and the lowest rates among the Atlanta ATL Airport parking facilities. Our lots are well lit, secured. fenced and gated with 24 hours attendant on site. Guest Amenities for parking at Peachy:Free Car Wash, Free Water Bottle ad free USA Today Newspaper in the mornings(M-F). 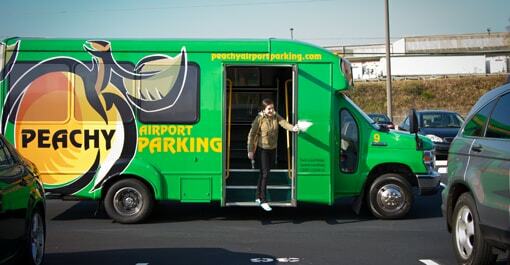 Peachy Airport Parking is the closest Atlanta ATL off-Airport parking located at 3100 Sylvan Road! Exit 75 off of Interstate 85 and make a right at the end of the exit ramp. Indoor further down the street on the left. We offer a completely indoor facility with extra-wide spaces and a friendly staff to assist you. We have brand new shuttle vehicles with dual air-conditioning and upgraded interiors. We offer the security and peace of mind you deserve and the lowest rates among the Atlanta ATL Airport parking facilities. Our lots are well lit, secured. fenced and gated with 24 hours attendant on site.